The Gateway Inn is right on Highway 76, the famous "Strip", across from Mickey Gilley's, White Water and the Red Roof Mall and next door to The Caravelle, Jim Stafford and Dutton's theatres. Forget about traffic, leave your car and walk to 14 different shows and restaurants. For simple relaxation you can enjoy staying at our pool area, where you can chat with your friends and watch the traffic on the Strip. The Gateway Inn offers 60 beautiful non-smoking or smoking rooms with two double beds or one king bed in a room. You will love staying with us and you will want to come back again and again as many of our guests, who have come back every year for decades. Check out our prices and take advantage of our internet rates and specials! 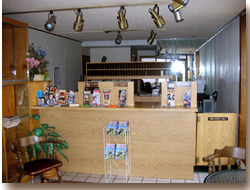 We also provide AAA and AARP rates and group discounts and our friendly staff is looking forward to taking care of you and making you feel at home.